It isn’t often that we hear about a sequel and get genuinely excited, but this one has real promise. Or rather, promises. Vulture hears exclusively that Vincent Cassel is now negotiating to join Viggo Mortensen in a sequel to David Cronenberg’s Eastern Promises. 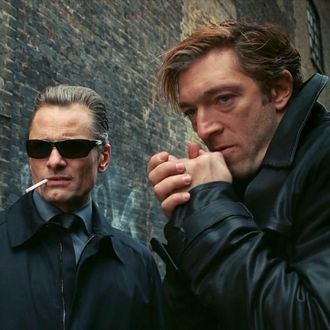 We hear the sequel, to be directed by Cronenberg* and written by Steven Knight (who also wrote the original), picks up where the 2007 film left off — with the incompetent underboss Kirill (Cassel) thinking that he and his henchman driver Nikolai (Mortensen) really have inherited the throne from his crime-lord father, without knowing that Nikolai is actually a clandestine agent working undercover in Russia’s federal security service. We’re told Mortensen will first star in Hossein Amini’s adaptation of Patricia Highsmith’s novel The Two Faces of January this fall but will then pivot to the Eastern Promises sequel at the start of next year. News of a possible Promises sequel first surfaced in March of 2010. * Due to an editing error, the original post mistakenly said that screenwriter Knight would be directing the sequel instead of Cronenberg.